We live in a fast-paced world where motor vehicles offer us the freedom and flexibility to go from one place to the next. However, this all comes at a price-traffic violations and fatalities, vehicle and road maintenance, car insurance and the list goes on and on. 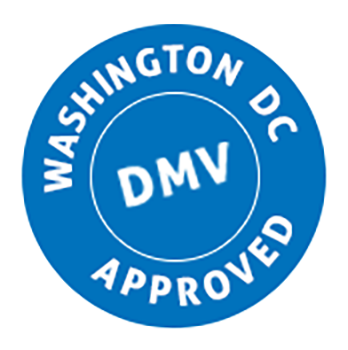 Our Washington, D.C. defensive driving courses provide you with the strategies and techniques to safely maneuver through the driving environment with the added bonus of point and insurance reduction. This is an online 8-hour Washington, D.C. Defensive Driving course that you can access 24 hours a day, 7 days a week and is fully narrated for your convenience. Successful completion of our course allows you to have traffic points waived from your record. Points can only be waived if you have approval from a DC Department of Motor Vehicles Hearing Examiner prior to taking the course. In addition to point reduction, you can also get an insurance reduction. Check with your insurance company prior to taking the course to ensure that completion of this course will reduce your insurance rates. What does this all mean? When you take our District of Columbia Defensive Driving Course, we'll show you how to reduce risk and remain safe when driving to avoid and prevent vehicle collisions. If you simply want to refresh your driving knowledge or take advantage of point or insurance reductions, then let's get started!